Species accumulation curves (SAC; or species-richness curves, collector’s curves, species effort curves) are used to estimate the number of species in a particular area. They can also be used to indicate the adequacy of a fauna survey in representing the fauna in a particular area. Typically, they can indicate whether a survey has caught 30, 50 or 90% of species in an area. 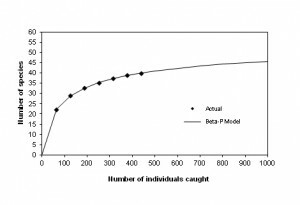 For example, in Plate 1, 40 species have been recorded after 439 individuals had been caught. Had the survey continued so that 1,000 individuals were caught, then an additional six species would have been recorded. The asymptote for this curve was 60 species, but this number would have only been recorded had the survey caught many thousands of animals. 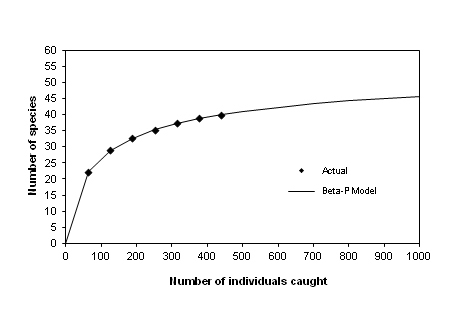 Different curve-fitting models often predict different values of species richness (for a given amount of effort) and the greater the extrapolation to a total species count the greater the error (Thompson et al. 2003). Certain methods of calculating SAC are more accurate for different taxa, or in different environments, or with different amounts or methods of surveying. As a consequence, using a readily available software package to calculate a SAC does not always give the best estimate of species richness, and if the person doing the analysis is unaware of how the SAC is being calculated, then they are likely to have little appreciation of its accuracy. Estimates of the total number of species in an area can also be calculated from data published in consultants reports or to verify consultants estimates of species richness (Thompson and Withers 2003). All that is required is a record of the number of individuals caught or seen for each species and the number of trapping days or survey locations for birds. This is a particularly power tool as it takes the guess work out of estimating species richness and the methodology generally indicates if inadequate survey effort has been applied to estimate species richness. As a matter of interest, environmental consultants, typically record 40-50% of the trappable species in each fauna habitat type. Some consultants are unaware of the difference between rarefaction and species accumulation curves, and often calculate and present rarefaction curves as species accumulation curves in fauna reports. Rarefaction curves are useful for comparing species richness values for different sampling efforts. Rarefaction cannot be used for extrapolation as it does not provide an estimate of asymptotic richness. In addition, under-sampling which is common for fauna surveys undertaken to support EIAs, often result in an over estimate of the number of ‘rare’ species (e.g. singletons and doubletons); and the greater number of ‘rare’ species reported in a dataset the more likely it is that other species that are present have not been detected. It is important that the SAC have at least commenced to plateau to provide a realistic estimate of species richness. Extrapolating a SAC without assessing the adequacy of the curve for the task is likely to provide a seriously incorrect assessment of species richness. Similarly, an inadequate number of captures can also mean the calculated SAC will provide an inaccurate indication of species richness. For more information on SAC and the adequacy of fauna surveys see section 11.11.1 and 11.11.5 in Terrestrial Vertebrate Fauna Assessments for Ecological Impact Assessment which is able to be downloaded on this website. If you are still having problems with your species accumulation curves or would like some assistance with analysing existing data, contact Graham. Thompson, G. G. and P. C. Withers. 2003. Effect of species richness and relative abundance on the shape of the species accumulation curve. Austral Ecology 28:355-360.